SENSE, is a decentralized messaging company from the team behind Sensay, announced today the development of the first decentralized messenger to be built on the EOS blockchain. Open and safe from outside control, the new messenger, Sense Chat, brings an enhanced level of capability to the decentralized messaging world, matching the experience of centralized applications like Skype, WeChat, Line and WhatsApp within a purely peer-to-peer environment. Capabilities at launch will include video and audio chat, text messaging and an integrated cryptocurrency wallet to allow users to earn and exchange EOS and SENSE tokens. 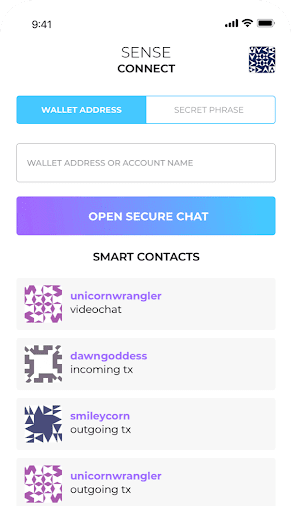 Sense Chat will be available on both desktop and mobile web, accessible to any device with a browser, enabling censorship-free communication and payment around the world. One of the initial decentralized applications (DApps) for EOS, the messenger takes advantage of EOS’s industry-leading processing speed -- 100,000 transactions-per-second -- to create a solution capable of supporting broad, mainstream adoption. Because the messenger is decentralized, each user acts as an individual node in the network with no central authority collecting and selling user data. Sense Chat is powered by Social Notification Service (SNS) technology, a new messaging protocol developed by SENSE. In addition to powering the Sense Messenger, SNS can be easily adopted as a protocol within other platforms and operating systems. For example, any application or DApp environment that wishes to include a lightweight messaging system that isn’t powered by any one centralized platform, but rather operates independently. The messenger will also feature its own EOS-based SENSE token (SNS) that will allow for in-app transactions.